Kamala Harris is an American Lawyer and Politician whose political career has seen a tremendous growth ever since she became the District Attorney of San Francisco in 2004. As a Democrat, she is campaigning her run for the Presidency in 2020. She is the junior United States Senator for California from 2017, and before that, she was the 32nd Attorney General of California, a position she held from 2011 to 2017. In 2017, she succeeded Senator Barbara Boxer, by defeating Loretta Sanchez in the 2016 Senate election to become California’s third female U.S. Senator, and the first of Indian ancestry. Kamala Harris was born on October 20, 1964, in Oakland, California, United States. Kamala Harris graduated from Westmount High School in Quebec, Canada. She then got enrolled at the Howard University in Washington, D.C. where she majored in economics and political science. At Howard, Kamala was elected to the liberal arts student council as freshman class representative, was a member of the debate team, and joined the Alpha Chapter of Alpha Kappa Alpha sorority. After returning to her hometown California, she got admission at the University of California, Hastings College of the Law, where she earned her Juris Doctor (J.D.) in 1989. She became an attorney with the State Bar of California in 1990. Her ancestry is Tamil (mother’s side) and Jamaican on her father’s side. She was raised by her mother after her parents divorced when she was seven years old. Her mother got a researcher position at Jewish General Hospital, and thus they moved to Montreal, Québec, Canada. Kamala was 12 years old at that time and her mother also taught at McGill University. Emhoff has two children from his previous relationship. Her husband once served partner-in-charge at Venable LLP’s Los Angeles office. Prior to her marriage to Emhoff, she had dated politician Willie Brown and journalist Phil Bronstein. In October 2009, Kamala Harris appeared on the News talk show, Hannity. Harris is considered as a top contender for the 2020 Democratic nomination for President of the United States in the 2020 United States presidential election. Serving as a junior United States Senator for California since 2017. She is the first black woman with South Asian ancestry to be selected as the district attorney in San Francisco. And, the first California attorney general with African-American or South Asian ancestry. According to the media, the combined net worth of Kamala and her husband Douglas is estimated to be between $2 million to $4 million. As per their revealed tax returns by Sacramento Bee in 2016, they had paid approximately $450,000 in State and Federal Income taxes. Her parents divorced when she was 7 years old and the court ordered the custody of the children to her mother. She raised her and her sister Maya. The sisters had a mixed upbringing as they were exposed to both the Hindu and Christian traditions. They went to a black Baptist church and a Hindu temple while growing up. When Kamala was 12 years old, her mother took them to Canada as she secured research job there. She returned to the United States for her higher studies. After graduation, she gained membership to the State Bar of California in 1990. She worked as a Deputy District Attorney in Alameda County, California from 1990 until 1998. In 2003, she got a breakthrough in her career after she was elected as the San Francisco district attorney, becoming the first woman, black, and South Asian to hold such a position. In 2004, The National Urban League honored Harris as a “Woman of Power”. In 2005, she received the Thurgood Marshall Award from the National Black Prosecutors Association. Kamala published her book “Smart on Crime: A Career Prosecutor’s Plan to Make Us Safer” in 2009. She discussed about how criminal justice was influenced by economic factors in the book. In 2011, she defeated Steve Cooley to become the California Attorney General, a position she held until 2017. By securing the position, she became the first female, Jamaican-American, and Indian-American attorney general in California. 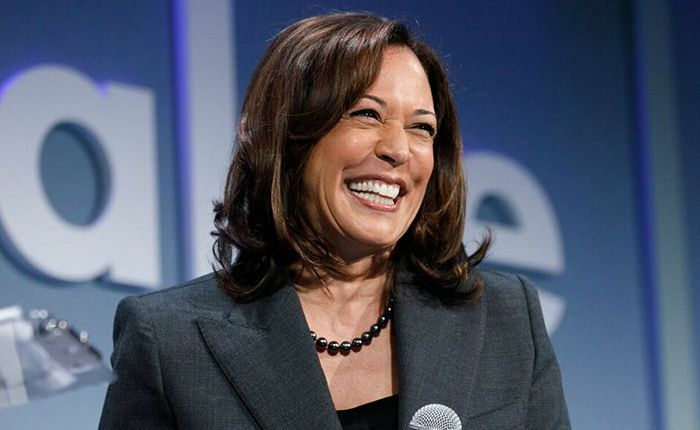 In 2016, Harris announced that she’s going to run for the United States Senate election in California after Senator Barbara Boxer announced her retirement. Harries raised around $2.5 million for her campaign and she was the forerunner through the election campaign. She won the 2016 senator election by defeating Sanchez with 62 percent of the vote. Kamala attracted huge media attention when she questioned Homeland Security Secretary Kirstjen Nielsen for favoring Norwegian immigrants over others and claiming to be unaware that Norway is a predominantly white country in January 218. Likewise, Harris questioned Facebook CEO Mark Zuckerberg for Facebook’s misuse of users’ data in April 2018. Harris had been considered a top contender for the 2020 Presidency. She officially announced her campaign for the presidency on January 21, 2019. Over 20,000 people attended her formal campaign launch event at Frank Ogawa Plaza in her hometown of Oakland, California on January 27. Kamala Harris has earned a couple of honorary degrees, including the Doctor of Laws (LL.D) degree from the Howard University in 2012 and the Doctor of Humane Letters (DHL) degree from the University of Southern California on May 15, 2015. In 2019, she published the book titled “The Truths We Hold: An American Journey” via Penguin press.